Pick up a copy of South Shore Living Magazine. We're their editors' pick for Best Boot Camp 2014! Visit our YouTube channel for coaching tips and funny clips! The great folks from PACTV came by and did a segment on one of our Roller Derby Boot Camps! 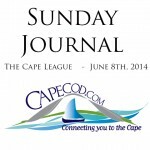 Thanks for the ShockYardshout out from Cape Cod Roller Derby in Cape Cod's Sunday Journal! "Roller derby has come to Cape Cod. We travel to the Hyannis Youth & Community Center to talk to organizers, Lynne Duquette Perera and Talia Arone." "Shockie (Laura) and Bombshell (Casey) have become some serious mentors to our league, going so far as to get some of us to take weekly trips to Plymouth to have the most fun a person could have while working out! If you're in the Plymouth area, you should definately check out their place, Shockyard Fitness & Social Club." "I have to say that this was the most fun that I have had since starting this website. We’ve Forrest Gump’d our way into some amazing situations, we’ve interviewed Peter Gammons and it was on the front page of Deadspin, we’ve had all access passes to music awards and visited Afroman’s hotel room, but this experience with the girls of The Cape Cod Roller Derby was far and away the most raw, unadulterated, pure fun that I have had yet."